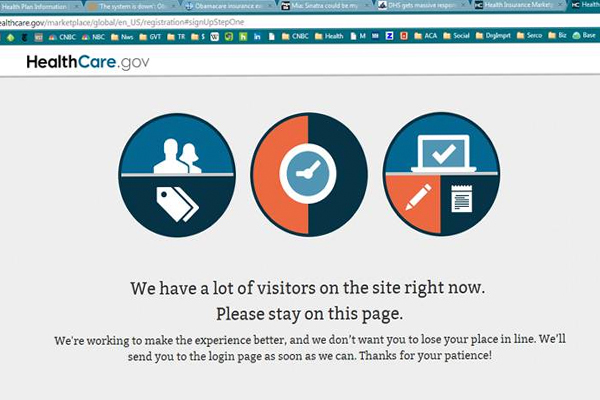 Hurry up and wait—for your Obamacare health insurance. The lags and service suspensions—which the marketplaces attribute primarily to high visitor volumes—drew harsh criticism from tech experts who said the system should have been better prepared. But Obamacare advocates said they are heartened by the level of interest—including 7 million unique visitors to the federal portal, Healthcare.gov, since it opened—which are helping to dispel fears that not enough people will enroll in the insurance plans. "Many people have waited years, or even decades, for this coverage, and they are not discouraged by Web slowdowns," said a spokesman for the federal Centers for Medicare and Medicaid Services. "We have added more servers and engineers, improved systems configurations so it can handle more volume, to improve wait times." The spokesman said those steps have "cut by one-third the volume of people waiting to apply." But John Sarich, vice president of strategy for VUE Software, a distribution management provider for insurance companies, said of the exchanges' rollout: "I think it was pretty poor. It had all the makings of a typical government deal." "I cannot imagine any Fortune 100 company—and especially the top 50 banks in the country—doing a rollout of a financial services product and having them bomb like this," Sarich said. "'You take a WellPoint, or Anthem Blue Cross and Blue Shield, they could do this in their sleep, because they've already got millions of insurance customers." Sarich said building the federally run insurance marketplace as well as of the 15 other health exchanges being run by individual states was hamstrung by two factors: not enough time to create something so complex, and government rules that effectively required the exchanges to be custom-built. "I'm going to write this system from scratch and do it in two years? Where have you been?" Sarich snorted. "Before I could call them fully functioning from a system standpoint, they're looking at 18 months more, minimum." Ronald Rogowski, a customer experience analyst at Forrester Research, said, "I just don't think people understood the magnitude of the traffic and the level of interest on the first day." "It's kind of disappointing, certainly, in this day and age that we're still at the mercy of some of the bandwidth limitations, and some of the infrastructure limitations," Ragowski said. "I get this is sort of a one-off thing, but there are many examples of companies, retailers dealing with this every year." David Hawkes, executive vice president of Eldorado, a Phoenix-based health benefit management company, said, "The exchanges are intended to allow people to enter some information about themselves and select from a range of plans that have different prices and options." "Technology, per se, is not really an issue. Travel sites such as Orbitz or Travelocity have been performing such operations for years," Hawkes said. "Modern technology is extremely capable of handling the types of activities required by the exchanges—pulling data from multiple places, presenting options via Web portals, handling high volume and processing payments." "Many issues plaguing the exchanges come from a lack of 'requirements,' which were not finally agreed or, at the very least, have only been recently agreed. Poor planning equates to poor start-ups," said Hawkes, whose company was recently acquired by the Hewlett-Packard-owned IT services company MphasiS. "Expect more bumps along the road." One side effect of the rush to rollout was the fact that just days before the opening, the Centers for Medicare and Medicaid Services delivered data to several big Web insurance marketplaces that will allow those markets to connect with the federally run exchange and enroll customers who will receive government subsidies to offset coverage costs. CMS had signed deals to partner with those for-profit Web markets to leverage their existing infrastructure and marketing muscle. CMS' delay means that the marketplaces—Ehealthinsurance, GetInsured, GoHealth and others—are not yet able to connect to the federal exchange and enroll customers. "In the beginning, our expectations were that we would have a very long time" to connect with the federal exchange after getting the CMS data, said Michael Mahoney, GoHealth senior marketing vice president. "You don't want to be building Best Buy, hours before Black Friday happens." Mario Schlosser, a computer programmer who co-founded the new health insurance company Oscar, said, "I'm not worried at all" about the traffic that has flooded and hampered the New York state exchange where his company is selling its plan. He added that he expects people to visit multiple times before they actually enroll. "I think it's pretty awesome, to be honest," Schlosser said. "The thing that we were fearing the most was that nobody was going to show up, or very few people were going to show up." Omar Hussain, CEO of the health-care IT security company Imprivata, said that any new technology platform will draw detractors who "will find something to criticize and find something negative." But Hussain said the rollout of the exchanges, and their associated tech hiccups or flaws, were a necessary step toward bringing health care and insurance to the same technological level that manufacturing and retail business have achieved over the past two decades. "Without innovation, without technology, health care will strangle the economy," he said. "This is just a new system, with new glitches. I'm sure they have a lot of challenges. The design will improve, the capability will improve, but the important part is transforming an industry."